Grevillea iaspicula, The Wee Jasper Grevillea, is a medium shrub with light green leaves and large clusters of cream and pink flowers that characterise this hardy Grevillea. In cultivation plants usually carry flowers for many months. Honeyeaters flock to the blooms. Pruning will keep plants compact and flowering profusely. G. iaspicula has proved to be frost hardy; drought tolerant and once established has low water requirements. 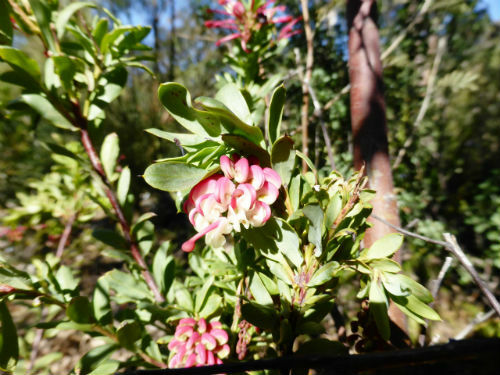 The Wee Jasper Grevillea is very rare and is found in southern NSW near Tumut. One population was nearly lost due to roadworks but was saved in the nick of time. The species is still under threat from grazing sheep and goats also blackberry invasion is a problem. Fencing and weed control are being undertaken. Also some sites are being replanted. There was an interesting report in Australian Geographic, August 2017. This documented that G. iaspicula flowered, in a nature reserve, for the first time in 20 years. We have found that our cultivated plants flower regularly annually. G. iaspicula was named in 1986 by D. J. McGillivray from material collected on a Wee Jasper property, southern NSW. The species name derives from “iaspis”, Latin for Jasper and “ul” which is Latin for small. The Wee Jasper Grevillea propagates readily from cuttings. In fact it is one of the easiest grevilleas to propagate.